Have you ever read a story and asked yourself how it would have turned out if you had been the protagonist? Pen-and-paper role-playing games spirit you away into your favorite stories and let you choose the path. 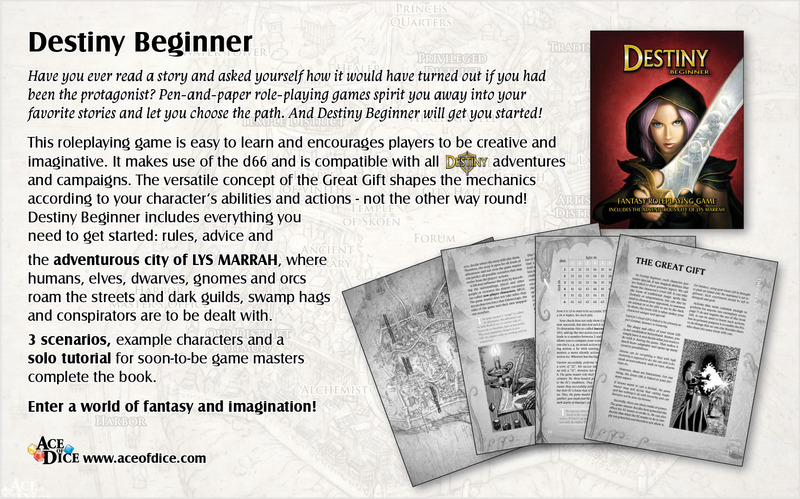 And Destiny Beginner will get you started in no time at all! Create your very own character in less than five minutes! Embark on quests with sword, magic and your brains! Equip your character with fantastic abilities that spark your imagination! Destiny Beginner‘s intuitive mechanics and versatile dice system can be effortlessly adapted to your own adventures! This book is for beginners as well as experienced players who appreciate freedom in their gameplay. It is for those who want to explore a world of fantasy and imagination or want to lead their friends there. In this book, you‘ll find everything you need: rules and advice, a detailed description of the exciting city of LYSMARRAH, scenarios and characters to get you started immediately and even a solo tutorial for game masters! Enter a world of fantasy and imagination!